The gift package includes a singing lesson with the founder and Choir Principal Rev Bazil Meade or an LCGC Choir Director. You do not have to possess the voice of a Song Bird or Lark, whatever your strengths or weaknesses, during the lesson you will effectively learn gospel singing techniques to brush up your vocal skills. Then you will attend an LCGC rehearsal where you will get to meet all of the choir members, and get to sing with them as an honorary member! You will then receive an official LCGC certificate that certifies your Gospel flair! You will be in a group of up to ten people. On purchasing this experience you will be given an open dated voucher valid for 12 months. The experience takes place on a Wednesday. Please call us to find out available dates on 0208 509 7288. 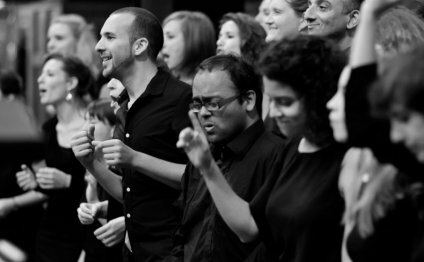 You don’t need to be a good singer to take part in this experience – just bring your energy and enthusiasm!! This experience is suitable for anyone over the age of 15 years. The singing lesson will take place at LCGC HQ in Walthamstow. The rehearsal takes place at our official rehearsal venue in a fabulous church in Islington. You will be expected to make your own way to both venues. Your travel expenses are not included in the package. You are welcome to bring along a friend to watch you experience gospel with LCGC! You can also use cameras and video cameras to capture your experience! Refunds are not permitted except where a confirmed booking is cancelled by us within 4 weeks of the experience day. 2pm : Arrival at LCGC headquarters in East London . 8pm : Meet the choir and join in the rehearsal. The LCGC band is renowned for its flair, funk and fusion. The band is made up of some of London’s best musicians who have played for the likes of George Michael, Will Young, Duffy and Westlife but to name a few and have a strong Gospel background that inspires their creativity. This gift experience allows any drummer or keyboardist the opportunity to learn from the best and enhance your skills and learn some new tricks! You will also be able to get an insight into the industry that the musicians work within and how to connect with the music and play with heart. This package allows you to have a 2 hour keyboard/drum lesson at the LCGC Headquarters in East London . This package is for a personal lesson with the keyboard player or drummer from LCGC. The lesson will last for approx 2 hours. The experience will take place in Walthamstow at LCGC Headquarters. You are welcome to bring a friend along to watch you during your experience.